On Friday, DeVos released her department’s proposed rule and welcomed public comment on it. 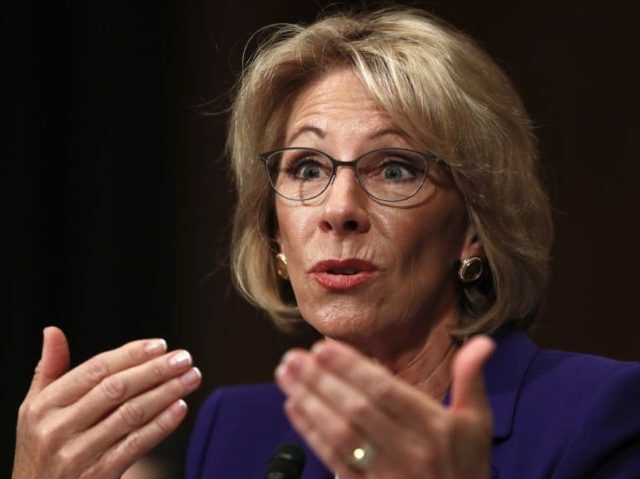 “Throughout this process, my focus was, is, and always will be on ensuring that every student can learn in a safe and nurturing environment,” the secretary said in a statement. That starts with having clear policies and fair processes that every student can rely on. Every survivor of sexual violence must be taken seriously, and every student accused of sexual misconduct must know that guilt is not predetermined. We can, and must, condemn sexual violence and punish those who perpetrate it, while ensuring a fair grievance process. Those are not mutually exclusive ideas. They are the very essence of how Americans understand justice to function. According to the statement, the draft rule would require colleges and universities to respond to and investigate formal complaints of sexual harassment. They would be required to hold a “live hearing where cross-examination would be conducted through the parties’ advisors,” the statement says. Personal confrontation, however, between the complainant and the respondent would not be permitted. Colleges and universities would not be allowed to use a “single investigator” or “investigator-only” model, according to the draft rule, and both parties would be permitted to appeal, if one is offered. The rule also adopts the Clery Act definition of sexual assault and includes it in the definition of sexual harassment under Title IX. Supportive measures to assist students during investigations into complaints of sexual misconduct might include changes in classes, counseling, no-contact orders, dorm room reassignments, and leaves of absence. Far too many students have been forced to go to court to ensure their rights are protected because the Department has not set out legally binding rules that hold schools accountable for responding to allegations of sexual harassment in a supportive, fair manner. By following proper legal procedures and receiving input on our proposed rule, we will ultimately have a final regulation that ensures that Title IX protects all students. The proposed rule will be open for public comment for 60 days from the date of publication in the Federal Register.